Student Housing University Of Akron: Welcome Back to School! Yet again, another summer has gone by. We hope that you’ve had a fun, rewarding, and fulfilling summer devoid of academic stress, writing papers, and endless studying. Perhaps you took a couple summer courses or you worked part or even full-time which is certainly a productive way to spend your time during the summer months. Regardless of how you ended up spending your time, we trust that summer was a nice, relaxing break before the Fall 2018 semester. Our University of Akron Apartments Wish You a Great School Year! Now we’re just a few days away from syllabus week! As the frenzy of freshman move-in week continues and you soak up the last sweet, sweet moments of summer, the EnVision Apartments, your trusted source for Akron apartments, offers a few pointers to help you smoothly transition into the school year and starting things off on the right note. Learn more about the student lifestyle at our pet-friendly student apartments in Akron by visiting here. Don’t be “that person” who busts through the doors of a 10 am lecture because you didn’t know where your class was. Even if you’re an upperclassman, the chances are that you’re not 100 percent familiar with every single building, wing, and corridor of campus — the University of Akron is a fairly sizeable place! At the very least, just make sure to give yourself plenty of time to make it to class during the first week of the semester. Our Akron apartments recommend filling out an academic calendar with the important dates as listed on your syllabus. Additionally, be sure to actually attend your classes during the first week, even if it is just a general course overview. Is your fridge full? Do you have protein bars and other to-go snacks on deck? Are all of your student apartment essentials taken care of like soap, dish towels, surface cleaner, and so forth? Are we starting to sound like a nagging parent when all you’re yearning for is genuine independence? 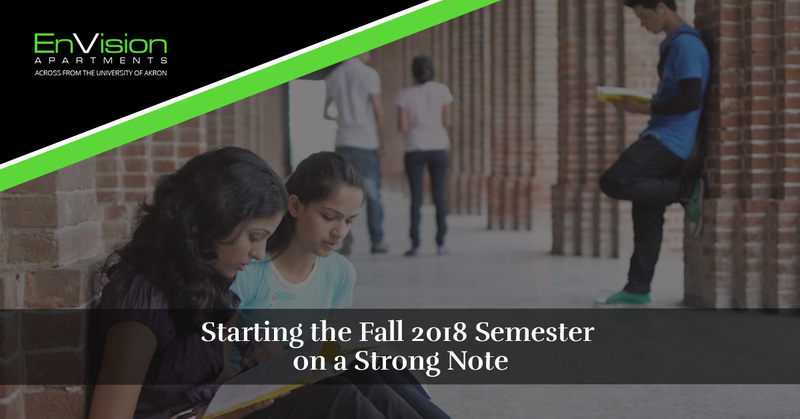 By taking care of the basics before the semester starts, you can truly focus your efforts and attention on what actually matters during college: studying and being a student. The fun will follow! If you’re going to be packing on a lot of academic stress with a full schedule and other obligations, relish the simplicity that is the remainder of summer. Do what you enjoy doing and focus on maintaining a healthy mental state going into the school year. From the EnVision Apartments to you, we’re invested in the success of our students. That’s why you can contact us at any time with any questions or to see how we can help you. Have a great upcoming school year!